You probably didn’t know Sally Goodrich. She was, among other things, a teacher and school administrator; a cancer survivor; wife of a small-town lawyer from North Adams, Massachusetts; the mother of a young man killed on 9/11; and eventually, a dedicated advocate for Afghan civilians, particularly for girls and young women. It was in this last role that Sally attained a modicum of notoriety. Not nearly as much as Greg Mortenson, the internationally acclaimed humanitarian and author of Three Cups of Tea. This week, in a devastating article published online and in a “60 Minutes” interview, author Jon Krakauer accused Mortenson of falsifying his memoir and worse, of ripping off the charitable foundation he established. We’re going to be hearing a lot about this story; we already are–which is why I’ve been thinking of Sally. The accusations against Mortensen, if true, present a depressing “teacup half empty” view of relief efforts in Afghanistan. Sally’s story, heartbreaking though it is, fills the cup again. Immediately after 9/11, Sally started, along with her husband Don and a few others, Families of September 11 (FOS11), an organization that worked on behalf of 9/11 relatives around the globe. I got to know Sally when I worked with the organization, first on the board and then as its executive director. She was a gracious and giving, with a sharp New England wit. Like all of us, she was suffering. Worse, on top of the delayed grief and depression, she had to deal with a diagnosis of ovarian cancer which came in 2002. It was a difficult time. Then, in 2004, Sally heard from a Marine in Afghanistan, a friend of her late son Peter, who asked her to collect supplies for school children. It was then Sally found her calling, a way to lift herself out of depression and create something positive to honor her son’s spirit. In 2005, Sally and Don founded the Peter M Goodrich Memorial Foundation. The organization has raised over a million dollars which was used to build a 500-student coed school and support others. It also supports an orphanage in the Pashtun region. Sally and Don have helped many students attend college in the United States. It also raises money for, among other projects, disabled landmine victims, a dental clinic, exchange students in the United States, victims of natural disasters and other school projects. 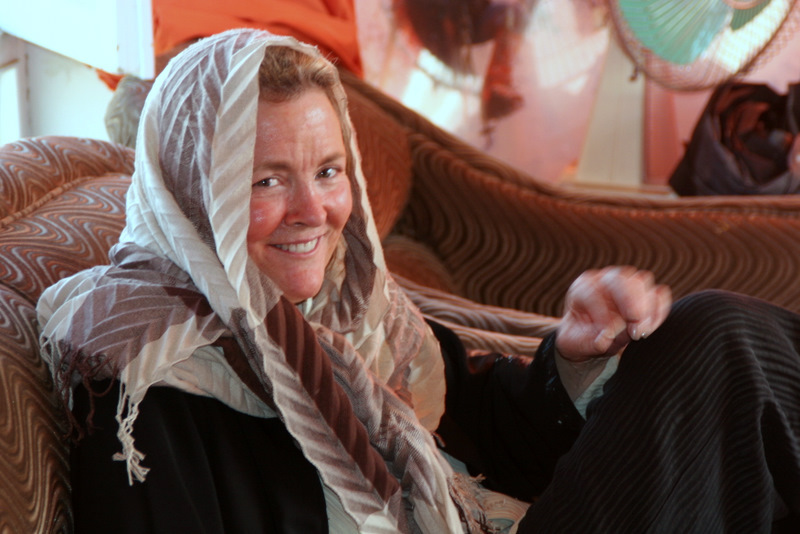 Sally made several trips to Afghanistan beginning in 2005. That year, she was ABC’s “Person of the Week” because she “turned personal loss into hope for hundreds.” She traveled back in 2007 and again in 2009. Then her cancer returned. In December of last year, Sally died at the age of 65. Sally was an eloquent woman but she never wrote a book, never went on a speaking tour, never took any money from the foundation. The projects gave her back her life, she said, and that was enough. For the hundreds she’s helped, it’s more than enough. Filmmaker Rick Derby has created a short film—Axis of Good— about Sally’s work. I hope this might take some attention away from the Mortensen story. Of course, big scandal and big money make up a bigger story, but sometimes a small tale holds a big heart. I’ve gotten increasingly interested lately in how people are getting their news: where they’re looking, what they’re reading, and who they’re listening to, sharing with, and commenting on. The Project for Excellence in Journalism (PEJ) tracks weekly the most and least-discussed topics by citizen bloggers as well as by mainstream media. Its “New Media Index” for June 29th to July 5th revealed a schism between mainstream media and the blogosphere. Few of the online commentators were talking about Michael Jackson’s death within a few days of that event (this was before the service), but instead had focused on the death of ubiquitous pitchman Billy Mays, along with marking the thirtieth birthday of the Sony Walkman. Meanwhile, mainstream press devoted 17% (17 percent!) of its content to the Jackson story over the course of the week. Events in Iraq and Afghanistan (the pullout in Iraq and the launch of a major new offensive in Afghanistan) accounted for about 5-6% of mainstream content and didn’t show up significantly on the blogosphere, although bloggers were discussing Supreme Court nominee Sonia Sotomayor that week. I don’t have PEJ’s figures for the past week yet, but I’ve made some anecdotal observations about stories that dominated and those with staying power. I’d guess the numbers will reflect activity on the pre-Independence resignation by Alaska Governor Sarah Palin, although interest waned as it became apparent there are only so many ways to keep speculating as to what she’s going to do next. Of course, as anyone within spitting distance of a switched-on television knows, Tuesday, July 7th was all about Michael Jackson’s all-day memorial service, what with anchors installed in LA as if it were a state funeral and reporters (including the Wall Street Journal, for chrissakes!) blogging in real time about what was going on every single minute. Meanwhile, other underemployed reporters rushed to Nashville in order to figure out how many details they could wring out of the sad story of NFL quarterback Steve McNair’s shooting death by his unhappy girlfriend, who then killed herself. I did notice, on several news aggregates a few scattered stories on the economy, focused on the reluctance of bailed-out banks to lend money, although they have no problem raising bank fees. GM caused a little flurry of blog excitement over its plans to release a plug-in SUV. Comcast, my current Internet provider, redid its home page. Now, in keeping with many other major server home pages, you can catch up on this week’s important stories and assume it’s all about whether Lindsay Lohan’s career is over. Good luck locating anything about President Obama’s African trip. It’s there, but not exactly prominently placed. Why do particular stories seem to rate endless coverage? Mainstream media curates the news; the editors and producers presumably try to give readers/viewers what they thinks that audience wants. Are these outlets off-base? On-target? Did we ask for or indicate we wanted so much attention paid to celebrity and so little paid to, say, international news or even the economy? Online, we have access to more information. And yes, we consumers presumably do the selecting. But is the blogosphere an improvement? If you look at consumer news aggregates – Digitt and Reddit and Topix and such – you see stories categorized as to what’s controversial and what’s hot, which may involve a story about renewed violence in Iraq or Britney Spears’ supposed disappearance. It’s not really equivalent – or is it to most news consumers? What makes the front pages of these news aggregates is what the readers say they like and the more they say they like or are interested in a story, the more they’ll see it featured. The favorites become more favorite; the other news may languish. A close friend is concerned that access to information falsely gives us the sense of being informed; that is, we’re not making distinctions between what’s important for us to know and what’s just distracting. True enough: The only way we’ll get exposed to a variety of stories if we make the effort to cast our gaze wide and deep. It’s our responsibility to stay informed; in fact, it’s on us to understand why it’s critical. On the other hand, Michael Jackson’s memorial service was a once-in-a-lifetime event, whereas certain stories, like plans to overhaul the health care system or try to resolve Mid-East problems, seem to be ongoing and without end. The photo on the front page of Monday’s New York Times of a soldier caught in a firefight in a remote region of Afghanistan came in the midst of a news cycle filled with depressing stories out of the region: Taliban takeovers of towns and villages close to Pakistan’s capitol city, new bombings in Baghdad and the story out of Afghanistan. That’s good to know. There are people in Afghanistan and in Pakistan who fervently support women’s rights, human rights and democracy. Possibly even more of the population simply wants to live in peace under whatever form of government is presented to them. In any event, we should support their efforts to live a life free from terror and intimidation. And it’s not quite fair to say we’ve turned our backs on Afghan human rights, regardless of which country our politicians may discuss from one day to the next. We’ve got boots on the ground there who will soon be joined by new troops our experts are moving from what we and they hope is a more stabilized Iraq. Although we have no troops in nuclear neighbor Pakistan, we have planes overhead and an Executive Branch proposal for nearly 3 billion in investments to support a military I worry seems far more focused on India than the Taliban militants. Decisions have to be made about how and where to place finite resources – our resources. Maybe that’s why it seems as if Uncle Sam is playing in high-stakes chess game all by himself. It’s no fun to be a superpower soloist. The authors of the piece about Afghan’s marching women note that “Democracy and progress are not products to be packaged and exported to Afghanistan. Afghans have to fight for them.” Absolutely true, as I think our government is beginning to figure out. Democracy promotion isn’t something that can be done strictly from the outside in. We should assist, support, speak out in no uncertain terms concerning anything relating to human rights. But as far as translating words into actions, we can always use a little inside help.